Grade inflation — the phenomenon of large numbers of students receiving ever-higher grades in class, regardless of how much they’ve actually learned — is more prevalent in higher-income schools than less affluent ones, according to research released today by the Fordham Institute. Many pupils who received passing grades nevertheless failed to score proficient on their end-of-course exam for the same subject, the author found. The study was authored by Seth Gershenson, an education economist at American University. Fordham is a reform-oriented think tank that has issued influential publications warning against false notions of academic success common among American students. The undeniable trend toward grade inflation has raised concerns in recent years, with high school graduation rates soaring around the country even as students make no comparable progress on benchmark tests like the National Assessment of Educational Progress. In a few high-profile examples, swaths of high schoolers have been granted diplomas despite falling far short of their schools’ academic and attendance requirements. 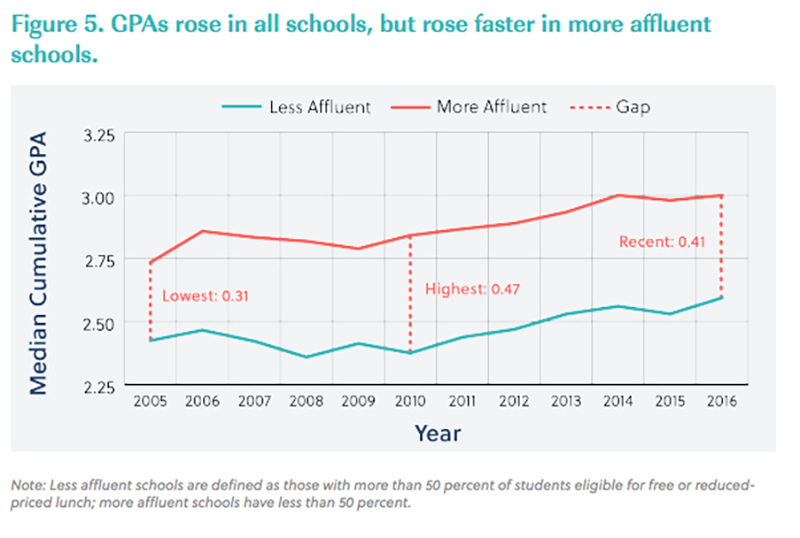 Previous studies — including one last year from College Board analyst Michael Hurwitz — have also pointed toward steadily rising average high school grades occurring alongside stagnant SAT scores, and noted that the problem is particularly evident in wealthier schools. But critics have pushed back, arguing that organizations like the College Board (which owns the SAT) have an interest in maintaining the supremacy of college entrance exams. GPA, they assert, tends to be an accurate predictor of academic success in college. Unlike the College Board report, which relied heavily on data from students who had taken the SAT (and who were therefore somewhat less representative of typical students, many of whom do not take the exam), Gershenson gathered student-level data for more than a million North Carolina students enrolled in an Algebra 1 course between 2005 and 2016. Since that subject is accompanied by a mandatory end-of-course (EOC) exam, it provided a good vantage onto the divergence between course grades and test scores. While students who scored high on the EOC exam tended to also earn a high course grade, Gershenson found that the reverse was not always true. Just 21 percent of students who received an A and 3 percent who received a B ended up earning a “superior” designation (the exam’s highest proficiency level). One-third of students who earned B grades failed to score proficient, according to the exam’s standards. In an interview with The 74, Gershenson explained that false impressions of proficiency, even if delivered with good intentions, can be damaging if they instill undue complacency among students and parents. Even more striking, not all students’ grades are inflating at the same rate. 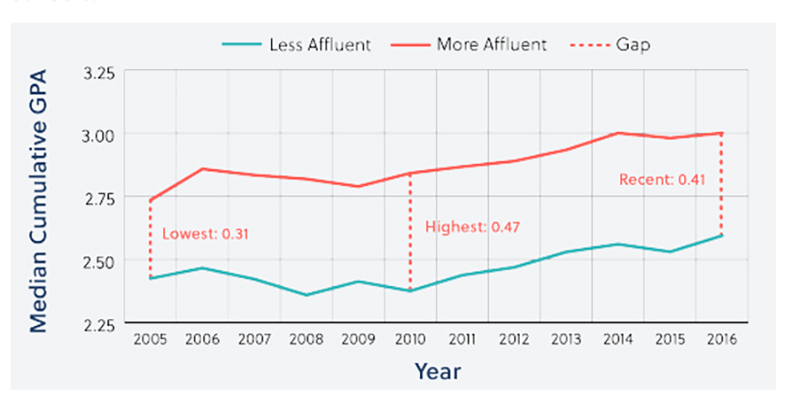 In the period Gershenson measured, GPA rose by an average of .27 points in affluent schools, compared with just .17 points in those that were less affluent. Not only does that provide an edge to already advantaged students, it could also amplify the disparity in expectations and confidence between middle-class students and their low-income peers, who are less likely to apply to selective colleges even if their transcripts and test scores merit it. Higher-income schools are likelier to feature college counselors and pushy parents willing to ask a teacher to consider raising C-pluses to Bs and Bs to As. According to Stuart Rojstaczer, a writer and former academic who has focused heavily on grade inflation in both K-12 and higher education, less fortunate parents may not have the same bandwidth. Even experts concerned about grade inflation agree that GPA is a worthwhile indicator of student achievement. It is generally believed that grades and test scores measure distinct attributes: While scores more aptly capture subject mastery and cognitive skill, grades give a broader picture that includes diligence, attendance, and participation. Jack Buckley, a senior vice president at the American Institutes for Research and a former College Board staffer who helped revise the SAT several years ago, agreed that the two metrics were actually complementary. Still, he said, the “inflation gap” along the income curve is concerning. Though he acknowledges the value of course grades, Gershenson concluded that grade inflation is indeed a cause for worry. The false signals, he said, were too pernicious to ignore.